Citi Double Cash Purchase Tracker — Revealed! The Citi Double Cash is, at face value, a no-annual-fee, 2% cash back credit card. 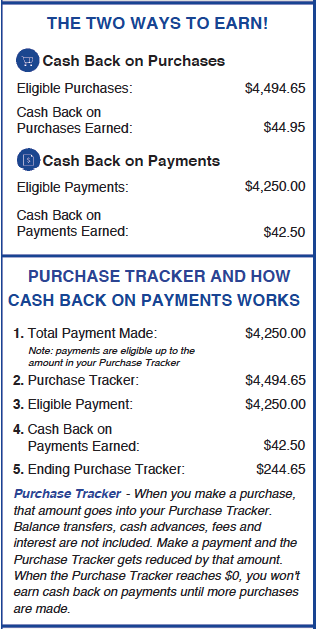 But rather than awarding 2% cash back on purchases, the geniuses in Citi's credit card division came up with a way to drag out their cash back awards over the life of a balance (compare to Barclaycard's practice of awarding Arrival+ miles as soon as purchases move to posted from pending status). "Cash Back on Purchases: Unless you are participating in a limited time promotional offer, you will earn 1% cash back based upon eligible purchases appearing on your current month's billing statement. Eligible purchases you make will be accumulated in the 'Purchase Tracker' shown on your billing statement. The Purchase Tracker shows the balance eligible to earn cash back on payments each billing cycle. "Cash Back on Payments: You will also earn 1% cash back on payments you make that appear on your current month's billing statement as long as the amount paid is at least the Minimum Payment Due that is printed on your billing statement and there is a balance in the Purchase Tracker. The balance in the Purchase Tracker is reduced by eligible payments you make. When the Purchase Tracker reaches $0, you won't earn cash back on payments until more eligible purchases are made." This Rube Goldberg contraption raised a few obvious questions: what's a "Purchase Tracker?" How often is it updated? Most importantly, would payments made against purchases in the same billing cycle award all 2% in cash back when the statement closed, or would cardholders have to wait for a second statement to close before they earned the second 1% cash back? Now that my first Citi Double Cash statement has closed, I'm prepared to reveal all. What does a Purchase Tracker look like? As you can see, my Purchase Tracker reflects all the purchases and all the payments I made during my first billing statement, and I received 1% cash back on each. The online Purchase Tracker only reflects purchases and payments on your last billing statement; it is not updated in real time, and my best guess it that it's unnecessary to wait for your purchases to post before making payments against them. In other words, all your purchases in the current billing cycle are added to your previous Purchase Tracker balance, and all your payments during the current billing cycle are compared to that new total. If your total payments are less than that new Purchase Tracker balance, you'll receive 1% cash back on the total payments amount. When redeeming your Double Cash cash back balance as a statement credit, you're informed that the redemption will not reduce the amount in your Purchase Tracker, since statement credit redemptions are not treated as payments. On the one hand, that means you won't earn cash back on the amount of your statement credit redemption. On the other hand, that means that even when you pay off your entire remaining balance, you will still have a balance in your purchase tracker. While you can redeem your Double Cash cash back for statement credits immediately, you cannot redeem your balance as cash back deposited into a bank account until you initiate two ACH "pull" payments from that bank account. Since my "payments" were balance transfers from my new Chase Slate card, I did not have any eligible linked bank accounts, and made a statement credit redemption instead. If you pay off your entire Citi balance before your statement closes each month, the Citi Double Cash card is a true 2% cash back card. If you instead take advantage of its 15-month 0% introductory APR by paying off your balance as slowly as possible, you won't receive the entirety of your second percent of cash back until you pay off your balance in your 15th month of card membership. For quite a while now, there have been two cards worth mentioning for everyday, non-manufactured, real honest-to-God spend: the Fidelity Investment Rewards American Express card, which gives 2% cash back on all purchases, and the Barclaycard Arrival (now Arrival+) MasterCard which earns 2 Arrival "miles" per dollar spend, redeemable for 1 cent each against travel purchases, with a 10% rebate on all travel purchase redemptions. With its $89 annual fee, the Arrival+ MasterCard is theoretically only superior (with its 10% rebate) to the Fidelity Investment Rewards card if you spend over $44,500 per year on your Arrival+. Thanks to Barclaycard's liberal approach to annual fee waivers, that hasn't actually been a binding constraint for literally anyone I have talked to about the card. But that fee waiver policy could change at any time, so the annual fee is still important to be aware of. Citibank has now entered the market with what claims to be a 2% cash back, no-annual-fee MasterCard. It's no secret that I've given Gary Leff a hard time about his fawning treatment of the card, but I'm not one to throw babies and bathwater out together. I'll probably get the card one of these days, and this is how I'll use it. Good try, but whoever came up with the unlimited 5-ThankYou-Point-per-dollar offer has apparently been let go, so they aren't just shoveling cash willy-nilly into furnaces anymore. What we don't know is what the hell a "Purchase Tracker" is and, most importantly, whether purchases show up there immediately upon posting or only after a statement has closed. There's simply no way to know until datapoints start coming in, but that's a potentially huge difference: will folks who pay off their entire balance before each statement closes earn 1% or 2% cash back on their purchases? For those who do wait to pay off their balances until after their statement closes, the final 1% cash back won't be earned until two months after the initial purchase was made. That makes the card a hybrid between the "old" Blue Cash's 2-statement delay and the Fidelity Investment Rewards card's 2% cash back program, which allows you to redeem all your rewards each month (as long as you've accumulated at least $50 in cash back). Many cards offer 0% introductory interest rates on purchases. The goal, naturally, is for customers to run up large bills during the interest-free period, then pay them off over time (or, realistically, never) once the promotional period ends. It's a ludicrously simple – and effective – trap for unsuspecting customers. Few of those 0% introductory rate cards offer 1% cash back on all purchases. None of them have offered 2% cash back on all purchases, until now. The Citi Double Cash card offers 15 months of 0% interest rate financing for purchases (and balance transfers, but with their 3% balance transfer fee). The 1% immediate cash back rate makes your initial manufactured spend purchases free once your first statement closes. Except they're better than free: they're interest-free. Fund Kiva loans with a US Bank Flexperks Travel Rewards card, stick the money in a Mango 6% APY saving account, or pay off your Blue Cash card and go around the track another time or two each month. No matter what you do with the money, your returns will be printed at the bank's expense, since the 15-month loan is interest-free. Then 14-and-a-half months later, pay off your Citi Double Cash card with your favorite miles-earning debit card and pocket another 1% cash back on the amount you've been floating. That's how I'll be using my Citi Double Cash card, once I make up my mind to actually apply for one. I'd love to hear from readers who have already decided to jump in: what the hell is a Purchase Tracker, and what else do we need to know about the card?